Roads Minister Chris Steel talks with MLA Joy Burch, left, and Kambah resident Taryn Langdon at Mount Taylor. Photo: Supplied. Access to the increasingly popular Mount Taylor Nature Reserve will be made safer with an improved, formal car park and signed entrance and exit points. 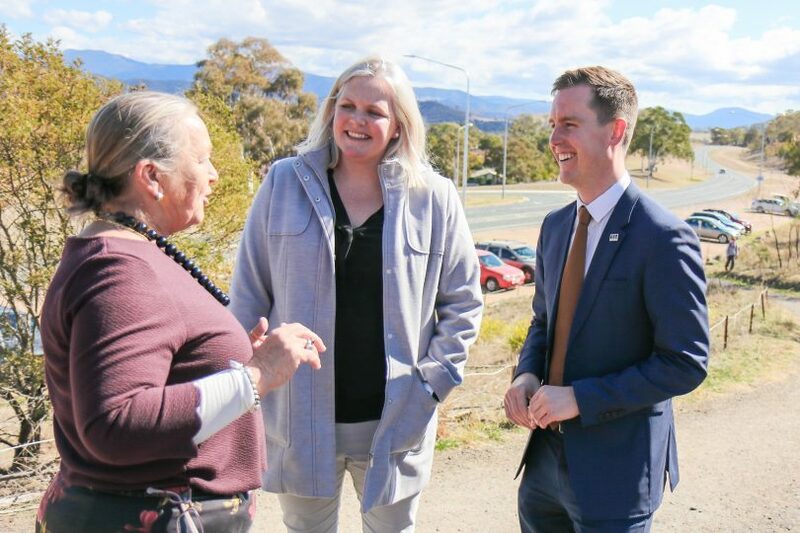 New Minister for Roads Chris Steel has announced the works in response to community petitions lodged in the Legislative Assembly, one sponsored by him last year and a previous one by Labor MLA Bec Cody. Liberal MLA Mark Parton, who also called for action almost a year ago to make the Reserve entry safer, welcomed the move, although he lamented the time it had taken to announce any measures. He had called for visible and safe entry and exit points to the Mount Taylor car park, safe crossings for pedestrians, footpaths, lighting, bins, improved signage and an investigation into a dedicated bike lane on Sulwood Drive. “The Government has well and truly dragged its feet to address safety concerns in this area,” Mr Parton said. Mr Steel said part of the verge on Sulwood Drive would be turned into a car park with only one clearly signed entry and one exit point, 150 metres west and east from the intersection with Mannheim Street. “A kerb barrier will also be placed on the road edge to prevent vehicles exiting and entering the car park directly around the intersection,” he said. Mr Steel said that the number of people using Mount Taylor for recreation was increasing with the walking trail attracting around 4000 visitors a month. Mr Steel, who is also a nearby resident, said that the combination of the intersection of Mannheim Street and Sulwood Drive and the informal car park was dangerous, and that traffic interventions were required. He said Transport Canberra and City Services had met with local members of the Kambah community to discuss the issues at the intersection before presenting draft plans for their feedback. “I’d like to thank local residents, including Taryn Langdon, for their constructive feedback and advocacy which has informed the design of these traffic improvements,” he said. Mr Steel said the Government was also investigating shared path connections on the southern side of Sulwood Drive and possible modification of the intersection with Mannheim Street and provision of a storage lane for vehicles turning right to Sulwood Drive. Signs to other entrances on Sulwood Drive to the mountain would also be provided. The car park works are likely to commence in October 2018 and cost about $200,000. The works will be complemented by the $75,000 outlay in the 2018-19 Budget for reserve and walking trail upgrades. Yep good start. This is a road, parking area and intersection that is in dire need of improvement. I don’t think this limited work will resolve the obvious line of sight problems for this very dangerous intersection, but it’s a good start. I’m sure any regular user would like to see a roundabout similar to the Sulwood intersections with Wanniassa roads Gaunson and Sainsbury. Maybe that will be the next stage. I do note that Sulwood was promised for Duplication in the early 80s. But self government put a stop to that.